Is 2012 the Year for Personal Transformation in a Deepak Chopra Way for Milwaukee Residents? AWAKEN Higher Brain Living™ will present two revolutionary talks in March helping people let go of stress and overwhelm at Milwaukee Body Mind Spirit Expo and The Domes - Dare to be Aware Fair. 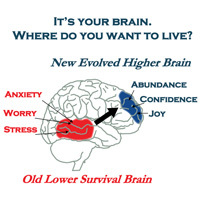 A one-of-a-kind technique that frees our fear-based lower brains, Higher Brain Living™ offers clients the chance to create an extraordinary new life, to thrive, to let go of stress and overwhelm, to experience joy, confidence, passion and to grow and evolve every day. with a focus on helping everyone to follow the words of Deepak Chopra: "When You Transform Yourself the world itself will also be Transformed." AWAKEN Higher Brain Living™ is providing solutions to dealing with the challenges of living in these hectic times that many times becomes a burden and many are seeking to handle these times with ease and confidence. If that sounds familiar there are Two Upcoming Events for individuals in the Milwaukee marketplace with interface sessions from experts that can help transform their daily lives. The ability to transform the brain's thought and energy pattern to a PERFECT stage is the fundamental concept marketed by Dr. Ann Bell and Dr. Drew Neville and their company called AWAKEN Higher Brain Living™. "Our program can show all individuals how to experience that special moment in their lives when they were experiencing that rare "On Top of the World" moment in which their brain thought pattern defined the word invincible," said Bell. "Are you living the life of your Dreams?" "Is your Inner/ Outer worlds Organized?" "Do you feel in Harmony?" "Are your interests being pursued due to a Spontaneous Reaction?" "If you can honestly answer NO to any of the above questions," said Dr. Neville, "than what you will learn from myself and Dr. Bell is how to transform your answers into a RESOUNDING YES .... with a focus on helping everyone to follow the words of Deepak Chopra: "When You Transform Yourself the world itself will also be Transformed." Higher Brain Living™ promotes a movement of energy from the lower survival brain to the higher part of the brain so a person can thrive in all areas of their life. Higher Brain Living™ signals a major physiological shift in the transformation of humanity. A one-of-a-kind technique that frees fear-based lower brains, AWAKEN Higher Brain Living™ centers offers clients the chance to create an extraordinary new life, to thrive, to let go of stress and overwhelm, to experience joy, confidence, and passion and to grow and evolve every day. Each client is provided a map and tools to be able to execute higher brain physiology which allows a new way to be, and a new way to do in the world. For more information go to http://www.higherbrainliving.com/.